Ted Cruz: Stream of global warming denial on Seth Meyers' show. In case you haven’t heard, Sen. Ted Cruz (R-Texas) is not a fan of reality. The reality of science, that is. He has a history of saying global warming–denying talking points and used some of his political power just this past week to pressure NASA into downplaying its role in measuring the effects of global warming on the planet. I just came back from New Hampshire where there’s snow and ice everywhere. And my view actually is simple: Debates on this should follow science, and should follow data. And many of the alarmists on global warming, they got a problem cuz the science just doesn’t back them up. And in particular, satellite data demonstrates that the last 17 years there’s been zero warming. None whatsoever. It’s why—you remember how it used to be called global warming and then magically the theory changed to climate change? The reason is it wasn’t warming, but the computer models still say it is, except the satellites show it’s not. There’s so much wrong in what he said that it’s almost cartoonish. It’s a tour de force of wrongness. Next, Cruz is right in one sense; we should follow the science. But the real science, not the nonsense he’s saying. Real science doesn’t cherry-pick one result that appears (incorrectly) to back up an outrageous claim, but ignore the overwhelming amount of evidence that this claim is dead wrong. He says satellite data shows no warming. That is wrong, wrong, wrong. Even giving him the benefit of the doubt, his saying this shows at best a gross misunderstanding of the data. And there is a vast amount of data from other sources showing the Earth is warming up. As the National Oceanic and Atmospheric Administration reported in February 2015, “[n]ine of the past 12 months have been either warmest or second warmest on record for their respective months.” And 2014 was one of if not the hottest year on record. 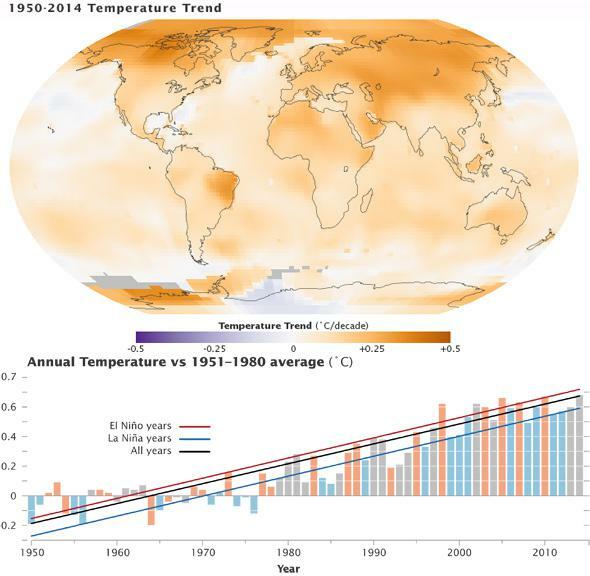 Top: The global temperature trend over time, from 1950–2014, in degrees Celsius per decade. Red means it’s getting hotter. Notice anything? Bottom: An “anomaly plot”; the annual global temperature trend over time where the average from 1951–1980 is set to 0. This shows what the actual temperature increase in degrees Celsius is. But of all the bizarre nonsense Cruz said in that interview, what really got my teeth grinding was his comment about how it used to be called “global warming” but now we call it “climate change” because the evidence doesn’t support warming. That is at the level of weapons-grade irony. The idea to start calling it “climate change” came from a Republican strategist, in an effort to make it seem less threatening. By saying that, Cruz has gone full Orwell: His own party made that change in phrase, but he’s accusing scientists of doing it. Ted Cruz is a flat-out science denier. He’s unworthy of a leadership position, especially one that deals with science. Yet he’s chairman of the Senate subcommittee overseeing NASA, and he wants to run for president. If there’s anything that can counteract global warming, it’s the chill in the air I feel from having to write that last paragraph. Correction, March 23, 2015, at 16:20 UTC: I originally misstated that the bottom plot in the picture had the average from 1950–2014 set to 0. The average is from 1951–1980.